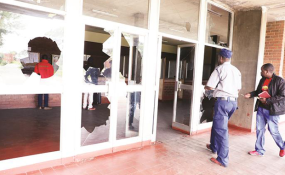 Police officers assess the damage at Makoni Police Station following violent demonstrations that left a trail of destruction in Chitungwiza and most parts of the country. Officer Commanding Chitungwiza Police District Chief Superintendent Sekayi Mujiwa says protestors that laid siege on Makoni Police Station in Chitungwiza, burning cars and destroying windows on Monday last week, had planned the attack and appeared to have received prior training. Narrating the horrifying events, Chief Supt Mujiwa said protestors surrounded the police station at around 11am and confronted passengers who were in three buses that had sought refuge outside the station. He said they ordered the passengers off the buses and robbed them of their valuables before torching the buses one of which they used to block the main gate. After fleeing from the reinforcements, the protestors went to the neighbouring VID depot where they gained entry after destroying a palisade. They shattered all the windowpanes and set ablaze three vehicles belonging to VID and one belonging to a civilian. Ms Chimhau said the protesters took several hours to ransack the depot and the depot cannot offer all services. The looting trail later spread across the town, with Chitungwiza Town Centre, Makoni and Chikwanha shopping centres among the most affected.